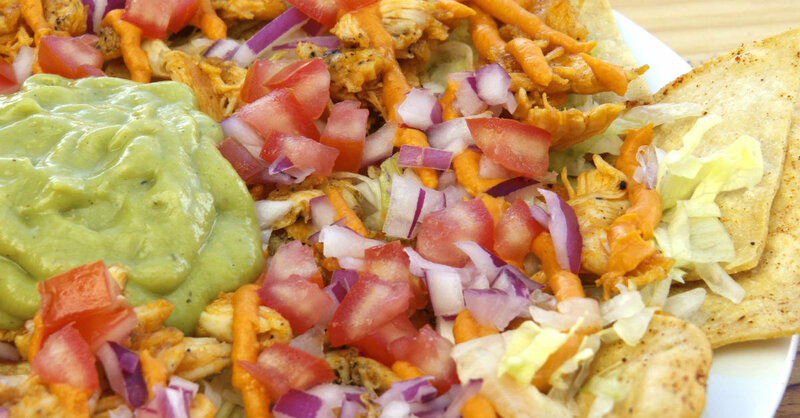 Your Favorite Buffalo Chicken Without The Hassle…These Nachos Have It All! Buffalo chicken wings are great, we can all agree on that, but – and maybe this is just us – wings in general just seem like so much effort (and mess), for not a lot of meaty goodness in return. Because we love that spicy flavor so much, we wanted to come up with something in the same vein as hot wings, but that was easier to eat and stuff in our mouths…this one is a real winner. Here, we combined buffalo chicken with the wonder that is nachos. Top it all off with a homemade buffalo ranch sauce and you’re in business! Once you try these, your old nachos might not live up to the new standard, but it’s worth the risk…we’re off to make ourselves some right now! In a medium bowl, whisk together 2/3 cup hot sauce with powdered ranch seasoning. Once combined, stir in chopped chicken and toss to make sure each piece is evenly coated. Transfer buffalo chicken to a medium pan and cook over medium-high heat for 5 minutes, or until heated through. Remove from heat, cover and set aside. Begin sauce by combining cream cheese, ranch dressing and hot sauce in a medium saucepan over medium heat. Cook, stirring continuously, until mixture is melted and smooth. Add cheddar and blue cheeses and cook until both are melted. Transfer mixture to a bowl or squeeze bottle and set aside. Assemble nachos by laying out a layer of tortilla chips in a large baking dish. Add chopped lettuce, then evenly spread out buffalo chicken on top. Sprinkle cheddar cheese over the chicken, then liberally pour buffalo sauce over the chicken. Repeat with a second layer of chips, chicken, cheese (if using) and sauce, then place baking dish in oven and bake for 3 minutes, or until mixture is hot and sauce is bubbly. Remove from oven and immediately garnish with tomatoes, red onion and guacamole. Drizzle with more buffalo sauce and serve hot!